For an airplane geek like me, today was absolute heaven. 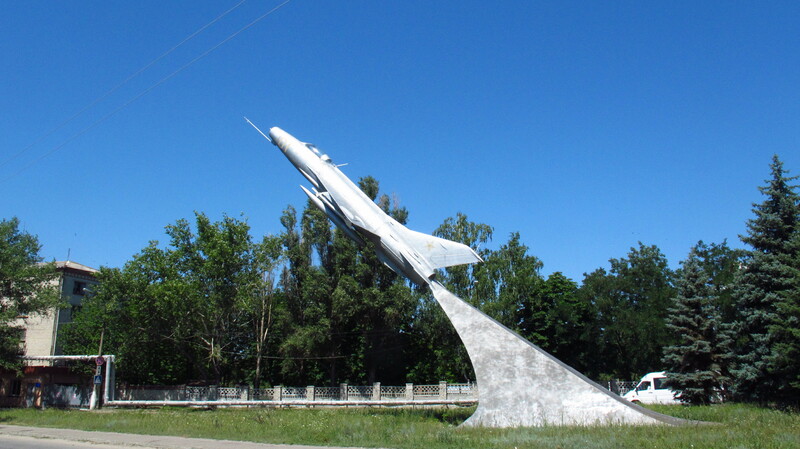 The place we went to was apparently one of the three best military pilot schools in the old USSR, and the enourmous complex where it was located, on the outskirts of Luhansk, is today partly abandoned, partly inhabited by locals, partly used by the army, partly an air museum. The bus dropped at the main entrance, where an old soviet reactor stood proud to remind people of what the place had been in other times. We went through the gate and I noticed that what must have been the entrance checkpoint had been turned into small shops and kiosks. The blocks of flats that flanked the main avenue were today inhabited by local people who had bought them cheap because they had been built long ago. Further into the complex, the trees and vegetation had grown wilder and from time to time I caught a glimpse of old buildings and warehouses that were part of the pilot school. 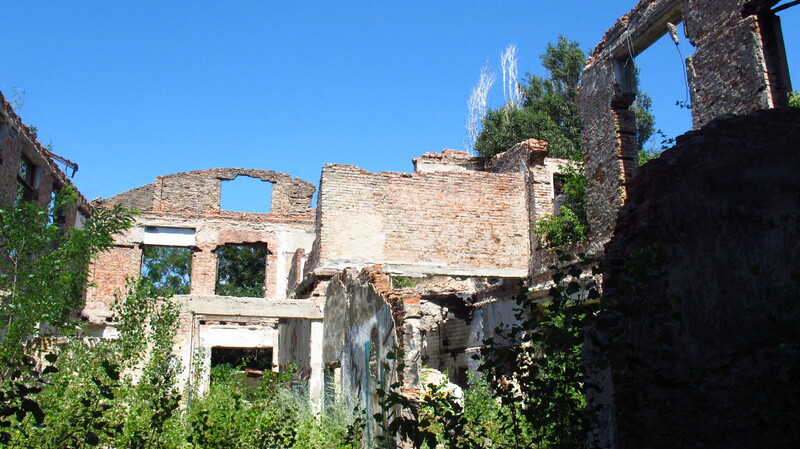 We were soon walking through overgrowth and half collapsed buildings, and it seemed rather strange that there was a museum somewhere in there, but you need to take into account that Ukraine has not developed a tourist infrastructure in most places. After a while we had got lost, and there was no one to ask. In the end we found some kind of old car park near another block of apartments and Anna asked a guy who was coming out the way to the museum. He sent us along a narrow footpath across a small forest that then turned into fields and we kept walking until I realized that we were on the schools runway. Far to our right we could see the tails of the planes in the museum. I asked Anna what use people made of the runway today, and she told me that a lot of people took their kids there with the family car to teach them how to drive, and there was also people who raced but that from time to time small private planes landed there. I was quite shocked that people were allowed to enter a runway that was sometimes active, and I asked her whether there was some kind of ATC or authority responsible for the place, but she didn’t know. 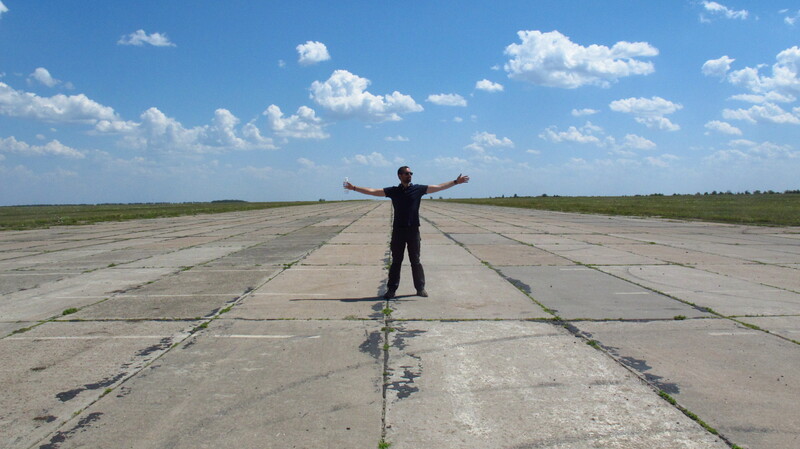 I took a couple of pictures – it is not often that you can simply walk into an active runway – and went to the museum. We had apparently come to the back door, and there was an old guy that took a lot of convincing to let us in through that gate. After assuring him that we were going to go straight to the main entrance and pay, he let us in. Anna asked him about the runway, and he said that they were responsible for the museum, and the military for the radio station next to it, if somebody decided to land their plane on the old runway, it was their responsibility to make sure they didn’t land on anybody. What a crazy country! Once into the museum, I had a wonderful time despite the tremendous heat. 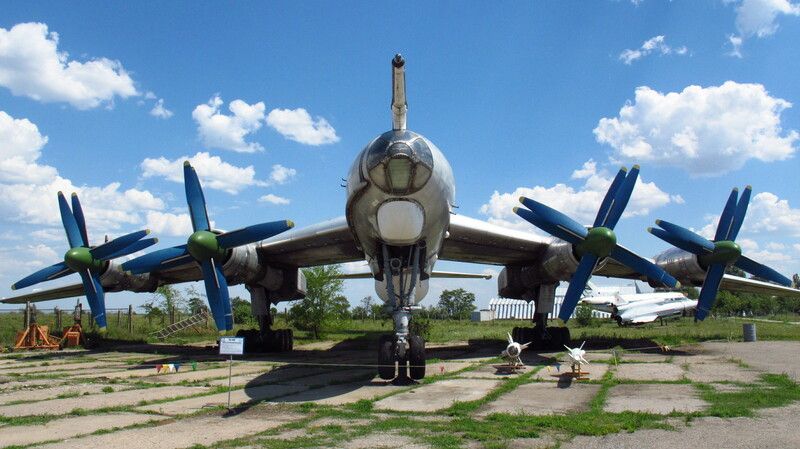 There were lots of planes I loved, like an Ilyushin Il-76, a Tupolev Tu-95, a Mig 29, a Sukhoi Su-27, a Beriev Be-12 and many others. The guy from the back gate came back, apparently having decided to make up for his earlier reception, and gave us a thorough explanation of the planes and helicopters there, although it was in Russian… Anna did her best to translate it for me. We came back to the flat to get some food and a badly needed shower, and I finally found a moment to write for the blog. In the evening we went back to the center to see the sunset from a park that overlooked the old part of the city. It was a wonderful last view of Luhansk. Tomorrow I’ll cross into Russia, and I am already nervous again about having to face the fearsome old soviet bureaucracy. This entry was posted in Stroming The World 2013, Travel and tagged Beriev Be-12, Ilyushin Il-76, Luhansk, Mig 29, Sukhoi Su-27, Tupolev Tu-95 by Kilian. Bookmark the permalink.